Nokia's factory in Jucu, Romania closes in 2011, Nokia confirmed in a press release on Thursday. 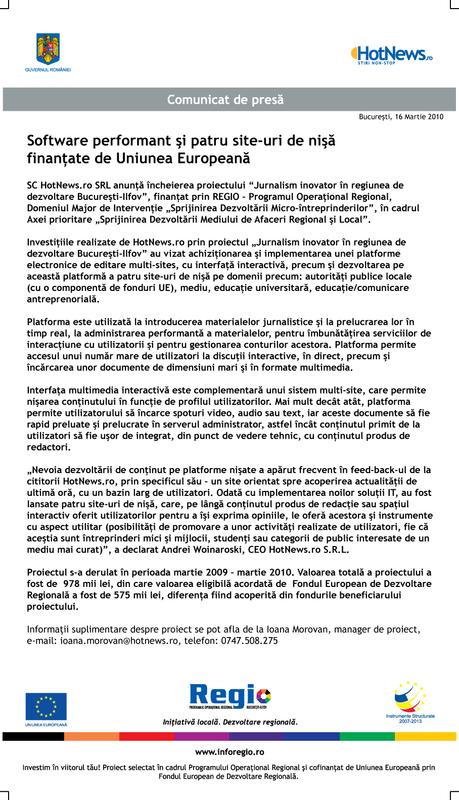 The information was first circulated by HotNews.ro and local news outlets in Cluj, quoting sources within the company. The Nokia press release says the closure in Jucu, Cluj county will affect some 2,200 people and says the measure was due to the need to optimize production processes, with priority given to factories in Asia. Some 1,900 employees of Nokia Romania convened for a meeting at the Jucu factory on Thursday morning, as rumors emerged about a possibler withdrawal of the Finnish investor from Romania, sources told HotNews.ro. Local news website StirideCluj.ro reported that employees were called on Wednesday to show up at work in the early morning hours on Thursday. Unnamed sources said that nobody knew what it was all about. Nokia inaugurated the factory in Jucu, Cluj county in NW Romania in September 2008, following a 60 mln. euro investment. At the moment, officials said they eyed a 3,500-strong workforce when produced would reach maximum capacity. Within three months after its opening, the Nokia factory dropped a limited number of employees, due to the crisis and a drop in demand. Nokia changed its top management in spring, naming Stephen Elop from Microsoft as CEO. He admitted Nokia was in crisis and had lost a massive share on the mobile phone market - from over 50% four years ago to some 25% now. The company in April announced a restructuring plan involving some 4,000 employees worldwide, including 120 from Romania. Nokia Romania's business in 2010 amounted to 6.76 million lei, with a net profit of about 181 million lei.